We choose to be joyful even when we feel like complaining. "Rejoice in the Lord always; again I will say, rejoice! Let your gentle spirit be known to all men. The Lord is near." Many years ago, when Joel was a little boy, he played legos for hours a day. He would design elaborate cars, towns, houses, roadways, playgrounds--whatever he could imagine. We all admired his skill. When he was about nine years old, he worked for months and months on a town that became an elaborate creation, around 5 feet wide. On top of this he had placed some of his best car designs. We all marveled at each stage of development of his wonderful creation. One day we hosted a family for lunch. When Joel took the boy his age back to his room to play, the little boy rushed into the room and began hitting and destroying the whole of Joel's creation before we could pull him away. The devastation was complete, and broke the hearts of our whole family as we had been bragging on his enormous Lego city for months. The little boy's mama said, "Oh well, boys will be boys!" Joel was heart broken and seemed to have a cloud around him for several days. When Joel was very young I noticed he whined quite a bit, but time had taught me he had a very strong sense of justice. I learned that if I sat down with him, eye to eye, and talked to him about how he was feeling, he would open his heart, reveal what was bothering him, and then he would not whine any more. What he needed was sympathy. On this particular week, I went into his room and sat down on the carpet next to him. We looked at the demolished legos, and I held one in my hand. "Joel, I can't even imagine how bad this made you feel. I would be so hurt. What bothered you the most?" "That boy had no right to be so destructive. I had never done anything to him. It took me almost a year to build all of these pieces. I just thought it was so unfair," Joel ended with a sigh. "I so understand, and I want you to know how very, very sorry I am. It was unkind and unjust." Then I prayed with him and blessed him. Later he said, "Mama, I think I can be strong now and build a whole new city. I just wanted someone to listen to me and to understand. Thanks, Mama." And off he went outdoors to play with the other kids. Life is a constant challenge, every day, all the time. Things quit working, someone makes a mess, a Christian friend offends us or rejects us, life just isn't fair. Jesus said, as a warning to us, a glimpse into how the world would be, "In this world, you will have tribulation." Tribulation can also be translated, "great stress." He forewarned us about what a fallen world would bring. But what can make it worse is children and adults who whine and complain all the time and never learn to walk within the realities of a fallen world. When we have tribulation of any kind, Jesus admonishes us to "take courage." Have courage, change your attitude from hurt to brave, from overwhelmed to "I can move through this with God's grace." The habit of whining and complaining turns quickly into nagging and an attitude of self-absorption--which destroys hope, light, and beauty. God is so clear about how he felt about the complaining of the Israelites. It led them to disbelief. They wandered in the desert for 40 years because of their complaining hearts and disbelief. This story is a great warning to our children as we are teaching the this way. When we choose not to practice trusting God, turning our hearts to faith and thankfulness that we are not alone, we are prone to wander in wilderness in our lives. It is not wrong to be sad or depressed because of a tragedy, because God is the one who supplied our ability to have emotions. We need and long for people who will sympathize with us. We need to have comfort for pain, brokenness, injustices in life. God wants to comfort us and we heal more quickly if we have someone who will help bear our burdens. For my sweet boy, this was a tragedy. But for Joel to become emotionally healthy and strong, I had to help him learn not to stay in the complaining/whining place but to learn to move to an attitude of gratitude. "God will comfort me. God will help me grow stronger. God is just. He understands. He is with me." The past couple of years, I have watched my oldest children seeking scripture over and over again to become peacemakers, to choose to be gentle, to choose to forgive, to actively trust God when unfair circumstances came along. I have been amazed as they have chosen to be faithful because scripture and training was the foundation of their hearts. And of course the result of their chosen pathway of obedience has been greater peace. I wish I could give them and myself a "G"-rated life where everything was fair and all people were healthy and loving. But that is not reality in a broken world. Teaching them how to love, how to be joyful as a choice, often by modeling those qualities ourselves, will evidence the reality of God's spirit in our own lives and give our children tools that will help them to be strong when they encounter inevitable trials as adults. 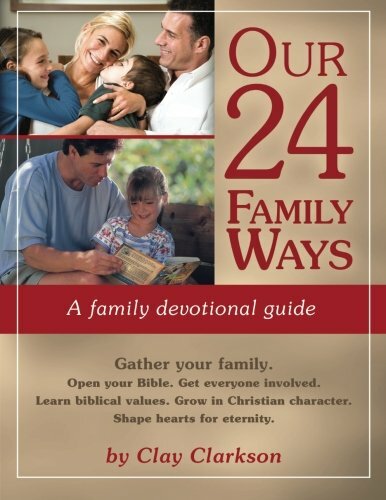 Do you have your copy of Our 24 Family Ways? Find it here!